Why Does My Dog Refuse to Let Go of the Toy That He Fetches? Teach your dog to let go during fetch. Fetch turns into a nuisance when Fido confuses the activity for a game of tug-of-war. Fido doesn't know the rules of fetch, so teaching him the rules is the only way to break the cycle so you and your dog can truly enjoy the game. 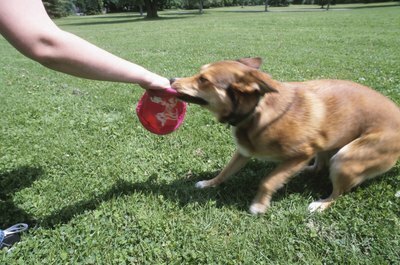 Before you can play a fun game of catch, you have to teach Fido the give and take relationship of fetch. Before taking your game to the big yard, stand with treats in your back pocket and out of your dog's view. Hold the toy and say “take it” as you wiggle the toy in front of your dog. As your dog begins mouthing the toy with you holding the other end, pull a treat out of your back pocket with your opposite hand and say “give it” and show your dog the treat. As your dog releases his mouth from the toy to take the treat, do not move the toy. Instead, say “take it” so your dog goes back to chewing on the toy. Repeat the steps for give and take several times until your dog will give you back the toy without being shown a treat. Start your game of fetch with a friendly warm-up of “give and take," so your dog can practice the commands with all the distractions nature has to offer. Give a command for fetch, such as “get it” and throw the toy. When your dog returns with the toy, place your hand on one end of the toy and pull a treat out of your back pocket with the other, while holding the treat about 6 inches in front of your dog. Say the “give it” command and let your arm go limp. Give the treat when Fido releases the toy. Say “get it” and have your dog take off after the toy. Continue to practice by pulling the treat out and saying “give it,” but once your dog is successfully letting go of the toy, stop showing the treat until after your dog lets go on the “give it” command. Some dogs are so treat-oriented that they'll completely forget about the game of fetch if they think a treat is waiting in your back pocket. On the other hand, some dogs are toy-oriented and couldn't care less about treats if toys are present. If either of these sounds like Fido, use a second toy instead of the treat for both “give and take” and fetch. Instead of pulling a treat out your back pocket, show your dog the second toy as you give the “take it” or “give it” commands. If you're using toys, do not use a toy that's regularly used for tug-of-war, since this can confuse the dog. Covering your dog's eyes with your free hand after saying “drop it” is enough for some dogs to let go. Another way is to grab both ends of the toy with each hand while standing in front of your dog and walk slowly towards your dog until he lets go of the toy. The dog might walk backwards for a while as you walk towards him, but sooner or later, he'll drop the toy. If Fido refuses to let go of the toy no matter what you do, ignore him and walk away. Don't talk to him, don't look at him, just completely ignore him until he drops the toy. The game is not fun for your dog if you're not willing to play. What Do Mountain Cur Dogs Look Like? Is It Good to Keep Your Puppy in One Area of the House? Does Gender Matter When Selecting a Cat As a Companion for a Dog? Is it OK for Cats to Play Tug of War With Toys?